TL:DR Do dropshippers need an advanced marketing platform? The short answer is yes. We go over the four stages that dropshippers have to go through to make ads and how advanced Facebook advertising platforms can help at each stage. Dropshippers that are good at what they do, are likely to need a platform that will help them to save time, increase profits, increase ROI and scale their activities multiple-fold. We aren’t just saying that because we happen to be an SaaS that is primarily a Facebook advertising platform. You can easily read lots of articles on why marketing and advertising is important for dropshippers. Here is a summary of the consensus more or less. Low initial margins would mean that you need every advantage to scale your ads and increase margins overtime. Committing to a better advertising solution means that you have to develop a long-term strategy that will win. Data is EVERYTHING. How do I analyse my data? How do I cross refer Ads Manager data against Google analytics? So, if you’re thinking, “Yeah, I already know all of this.” Then you might have already seen the benefits that advertising can give you and it might be time to scale. "I only survive on 4 hours of sleep and coffee is now a major food group." Does that sound like you? Research. Create. Test. Optimize. Repeat. 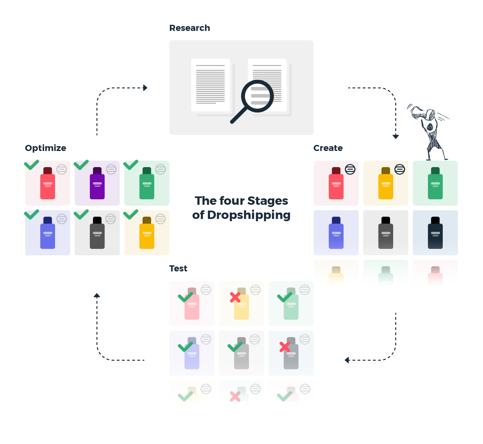 The 4-step process of having to research products that are likely to convert, create multiple ad sets for all of them, continously test which works and which does not, optimizing the best performing ads and then repeating the process is never ending. You can’t afford to waste time on products, tools and strategies that will simply not work for you. 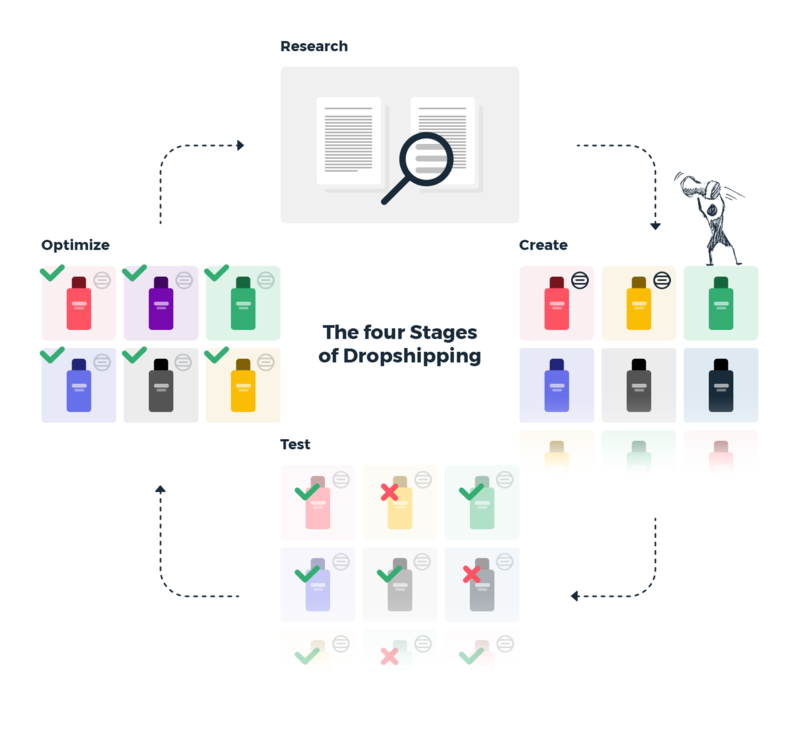 Let me take you through the four stages of dropshipping to show how having an advanced advertising platform can be the difference between becoming an expert dropshipper with higher margins and a novice that is still trying to make it big. First, you find images of products that you want to sell. Then, you have to manually add icons, prices, your logo (if you want to) and so on. Doing this for one ad set might not be a big hurdle to overcome. However, when you have to do it for multiple ad sets in the tens and hundreds, then the task becomes more daunting. As a results, it can take anywhere from 3 hours upwards depending on how much you dedicate to creating the ads. As a dropshipper, you might not necessarily care about marketing. However, even if you don’t care about that, you care that your ads will lead to sales. That’s why your creative should look good every time. Simply put, attractive visuals lead to 65% increase in engagement. Some advanced platforms can help with creating better visuals. An example is the template editor which can help you to automatically create the images for all of your ads at once. Imagine that! Hours of manual labour dwindled down to 30 minutes of simple design and implementation. Making a pretty visual is one thing but some products will simply not convert at the rates that you need them to convert. That’s why you need to test with ruthless abandon. So, you watch multiple ads and compare them to see how they perform. The best performing ads win and the rest are scrapped. The problem is that, this is so time-consuming that your margins suffer. Instead of adapting to a campaigns performance instantaneously, precious time is lost on trying to figure out which ads win and which ads lose. A good advanced platform will help you to make testing hundreds of ad sets easy, fast and workable. You can split your tests into regions, product types, and more. You can also apply ad rules for your tests so that, based on your preferences Facebook will take action on your ads. So, if you decide that you will only push your resources towards ads that have a .5% CTR or higher then you can make that possible. The hours it would normally take can be dwindled down to an hour. This might be the fastest part of the cycle because if you know which ads are performing well, then you can simply make more of those type of ads or enhance specific features that you know are working. If you already have a platform that can help you to scale your testing and build a strategy around it, then it is easier to pinpoint why some ads work and double down on those reasons. You might have noticed that is slightly out of order from what I mentioned earlier. That’s because as you learn from the previous stages you will be able to discern what works and what does not. If you have a platform, this can take a few hours based on your past knowledge. If you don't have one, then it could take significantly more time. If you don’t have a platform this part can be daunting. However, if you have implemented work arounds such as automatic rules, automatic testing with dynamic creative, dynamic product ads and segmentator, then this becomes easier and will require far less resources. These are resources such as time and money that could better be used to grow your business. If, you still aren’t convinced and want to know if ROI Hunter is right for you, then contact us to discuss an opportunity for a free trial. Simply click on the link below. You can’t afford to waste time on products, tools and strategies that will simply not work for you so you always have to be alert.